When I was first asked to go to Esthetique Salon a week ago, I simply rolled my eyes, trying to figure out a way to get out of writing this article. Just hearing the word "facial" used to make me cringe, imagining questionable oils, lotions and creams being rubbed all over my face for a "pretty" price. When I walked into the salon, my ears were greeted by relaxing background music coupled with the sound of running water from a fountain in the lobby. My nose was also pleasantly welcomed by the incredible scent of mixed herbs and spices. My eyes were treated to a beautiful lobby reminiscent of the vestibule of an elegant mansion. Feeling a little more relaxed by the atmosphere, I made myself comfortable in one of the stuffed armchairs by the coffee table. Once seated, I took a deep breath, trying to imagine what kind of questions I could possibly come up with on something about which I have no idea. The manager, Kuniyoshi-san, joined me at the coffee table and started explaining what she does for a living -- waxing, facials, electrolysis, deep-pore cleansing, foot and neck massage, and so on. The more I listened to her, the more I realized that my face and body were begging to be pampered. It was almost as if they were pleading, "Wax us! Clean us! Massage us! Remove us!" 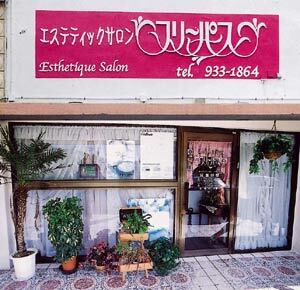 I found out that Kuniyoshi-san had received certification in the U.S. for permanent cosmetic make-up and is also a professional electrologist certified by the American Electrology Association. Impressed? I was. Esthetique Salon has not provided full body aroma massages up until now but has decided to add them to their list of services starting from this Mother's Day weekend. For ¥4,500 they will give a 60-minute full-body aroma massage or a full-body oil massage. The 60-minute massage also includes a footbath. They will continue to offer their regular 30-minute massage course for your neck, shoulders and back for only ¥2,000. They take the time to consult with their customers before starting the aroma massage to determine which kind of aromatherapy oil is best suited to your specific needs. Once Kuniyoshi-san let me smell the oils used in the aromatherapy massage, I found myself wishing I didn't have to get back to the office after our interview. If time had permitted, I would have begged her to fit me into her schedule for a massage after our visit. An American customer who had just had an eyebrow wax walked into the lobby in the middle of the interview. After chatting with her, I found out she had gone to beauty school in the U.S. and feels that Esthetique Salon's prices beat the average prices found in America. This satisfied customer told me that Esthetique Salon not only waxes your eyebrows but trims them as well. She said that the eyebrow wax was a little less painful than the waxing done in the States and was curious to know the secret. After she left, I found out the answer to this question. "We use a mixture of pine tree sap, royal jelly and other things instead of the usual honey that is used in the States," was Kuniyoshi-san's response. I had been afraid of getting my eyebrows waxed because of the pain I imagined that accompanies waxing. But this piece of information made me realize my wolf-like eyebrows needed some care. For those of you who have been to Esthetique Salon before, if you take a friend with you (who is a first-timer), you will receive a 10 percent discount. If you need some well-deserved pampering in your life, pick up the phone and make an appointment today. I know I will.